This is the first major feature length drama on the life of St. Anthony of Padua, the beloved miracle worker and one of the most popular saints in Christian history. Made in Italy with top-notch acting talent, and superb cinematography, this is an outstanding film on the amazing life of St. Anthony. It presents Anthony as a dynamic and appealing person who sacrificed wealth, popularity and family for the Kingdom of God. 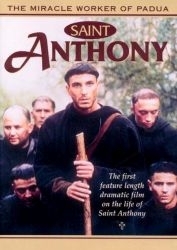 Born into a Portuguese noble family in 1195, Anthony defied his father's wishes to become a knight and, instead, followed the call of God to become a monk, eventually joining the Franciscans as a follower of St. Francis of Assisi. Anthony became renowned for his powerful preaching and his miracles that won countless souls to Christ. The film follows his travels through Italy, his mission to Morocco and his meeting with St. Francis. It beautifully portrays the power of his preaching, the holiness of his life, his love for the poor and oppressed, and the wonders of his miracles. Actor Daniele Liotti gives a truly memorable inspiring and performance as St. Anthony.